Why do today’s parents spend twice as much time with their kids than their parents spent with them? Recently, the Pew Research Center released an excellent analysis of how mothers and fathers spend their time. It shows that “the way mothers and fathers spend their time has changed dramatically in the past half century.” The data track back to 1965, providing a look into time use which spans nearly 50 years. Mothers are working significantly more hours than in 1965 while spending less time with housework and more time with child care. Fathers have increased the amount of time they spend doing housework and child care. This release is a fascinating view of how parenting has changed. We decided to take a little different look at this data to see what it could tell us about parenting across the generations. 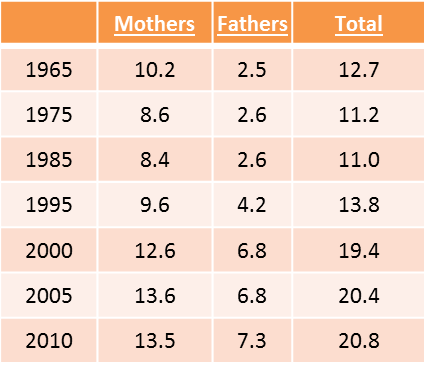 The table below shows the number of hours per week spent by mothers and fathers in child care since 1965. As you can see, the total number of hours parents put into childcare increased considerably starting in the late 1990’s. It jumped up to be close to double what it had been, and has stayed there ever since. So, what is the explanation for this? Why did parents start to spend almost twice as much time taking care of their children in the late 1990’s? There are likely many possible explanations, but we tend to think there are generational factors at work. Below, we show the dominant child generation during each of the data collection points above. Here, we can see that in the late 1990’s, we were near a Millennial peak. 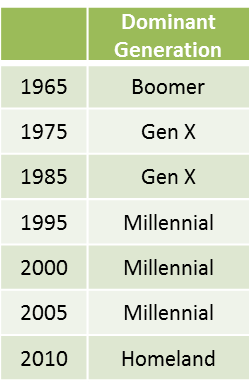 Indeed, according to Howe & Strauss the Millennial generation birth years are 1982 -2004, so from the late 90’s into the early 00’s the entire under 18 population was made up of Millennials. We know that Millennials have been “heavily parented” – but the question that remains is why didn’t we see the increased child care time earlier in the Pew analysis?By 1995 Millennials were the dominant child generation, yet increased child care time did not manifest itself until the 2000 data. The answer (from a generational sense) lies with the parents. For most generations, about halfway through their birth years the predominant parental generation changes. For example, most Millennials born in the 80’s and early 90’s were mostly born to Boomer parents. Since that time, the predominant parental generation has shifted – the back half of the Millennial “boomlet” was birthed to mostly Xer parents. The increase in child care time seems to have come almost precisely when Boomers stopped having children and Xers started having children. That seems to be the answer: parents started spending almost twice as much time taking care of their children as soon as Boomer stopped being parents and Xers started. It stands to reason that Boomers and Xers are very different as parents. Boomers have been characterized as having a permissive and risk averse childhood, having come of age at a time of great social upheaval, and to have become a bit self-absorbed as parents. They are perfectionists with their children, whom they see as a reflection of their own desire for self-actualization. By contrast, Xers were the first “latch-key” generation, and learned quickly to be resolute self-starters, independent, tough, and hands-on managers in all they do. This including raising their children, whom they clearly have chosen to spend considerable time with. Interested in learning more about the generations? We’d recommend this book by Howe & Strauss, as a start!